One of the most exciting and influential events in the city’s social calendar. The glitzy awards evening and dinner celebrates the best Carlisle has to offer; with its thriving nightlife, first class hospitality and outstanding retail and beauty services. We are looking at some exciting new ideas for our 2018 event, details are still to be confirmed. Golden Apple Awards; recognising and rewarding excellence in education and leaning in our County. Last year’s glittering event was the eighth annual CN Group Education Awards for Cumbria and we were delighted at the positive reaction from all those who took part and from those who attended the awards evening and dinner at The University of Cumbria. Full details of the 2018 ceremony will be announced soon but all our 2018 finalists are guaranteed a gala evening to remember. In-Cumbria Business Awards; recognising and rewarding the best of Cumbrian Business. This black-tie event is one of the most important and influential evenings in the county's social calendar. Invited guests will receive the red-carpet treatment with a drinks reception, top class dinner, entertainment and exceptional networking opportunities. This year the event is being held at the Halston on Thursday 15th November. 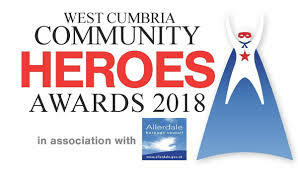 The Cumbria Community Hero Awards are aimed at recognising who the real heroes in our community are. Across counties from carers to parents, neighbours, young or old, anyone is truly worthy of an award.